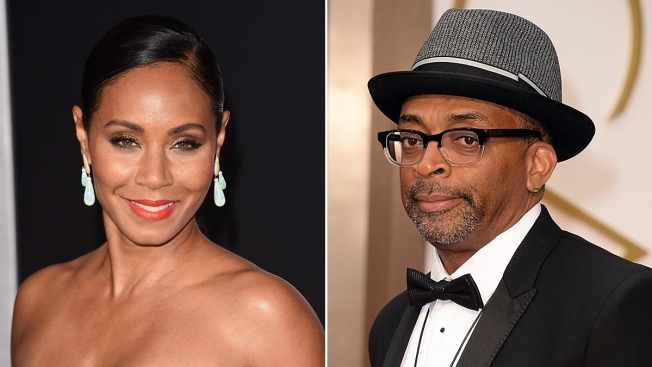 Calls for a boycott of the Academy Awards are growing over the Academy of Motion Pictures Arts and Sciences' second straight year of mostly white nominees, as Spike Lee and Jada Pinkett Smith each said Monday that they will not attend this year's ceremony. In a lengthy Instagram post, Lee said he "cannot support" the "lily white" Oscars. Noting that he was writing on Martin Luther King Jr. Day, Lee — who in November said he was fed up: "Forty white actors in two years and no flava at all," he wrote. "We can't act?!" In a video message on Facebook, Pinkett Smith also said she wouldn't attend or watch the Oscars in February. Pinkett Smith, whose husband Will Smith wasn't nominated for his performance in the NFL head trauma drama "Concussion," said it was time for people of color to disregard the Academy Awards. "Begging for acknowledgement, or even asking, diminishes dignity and diminishes power," she said. "And we are a dignified people and we are powerful." She added: "Let's let the academy do them, with all grace and love. And let's do us differently." Last year's all-white acting nominees also drew calls for a boycott, though not from such prominent individuals as Lee and Pinkett Smith. Whether it had any impact or not, the audience for the broadcast, hosted by Neil Patrick Harris, was down 16 percent from the year prior, a six-year low. This year, academy president Cheryl Boone Isaacs has made a point of presenting a more inclusive show. The Feb. 28 broadcast will be hosted by Chris Rock and produced by "Django Unchained" producer Reginald Hudlin and David Hill. On Saturday, Rock, unveiling a new promotion for the broadcast, called the ceremony "The White BET Awards." The academy didn't immediately respond to messages left Monday. The hashtag "OscarsSoWhite," created last year, was quickly resurrected online following the nominations. Rev. Al Sharpton — who last year met with former Sony head Amy Pascal following leaked emails that some viewed as racist — on Friday lambasted the academy. "Hollywood is like the Rocky Mountains, the higher up you get the whiter it gets and this year's Academy Awards will be yet another Rocky Mountain Oscar," said Sharpton. In his post, Lee made it clear the Academy Awards is only part of the problem in an industry with deep-rooted diversity issues. In his Governors Awards speech, Lee said "It's easier to be the president of the United States as a black person than be the head of a studio." "The Academy Awards is not where the 'real' battle is," wrote Lee on Tuesday. "It's in the executive office of the Hollywood studios and TV and cable networks. This is where the gate keepers decide what gets made and what gets jettisoned to 'turnaround' or scrap heap. This is what's important. The gate keepers. Those with 'the green light' vote."